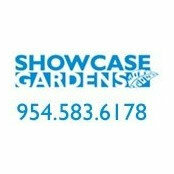 Showcase Gardens is a South Florida landscaping company that specializes in Landscapes that Last. Showcase Gardens combines modern design with water conservation to create low maintenance landscapes in Broward County including Fort Lauderdale, Coral Springs, Davie, Hollywood, Oakland Park, Parkland, Pembroke Pines and Wilton Manors. Landscape design, landscape installation, landscape maintenance, irrigation, water features, drought-tolerant garden design, xeriscape, tropical garden design, low-maintenance landscaping. Комментарий в: GroundcoverThe dark green with rounded leaves is Green Island Ficus. Комментарий в: Palms?From left to right: Ptychosperma schefferii (Schefferii palm), Ptychosperma elegant (Alexander palm), Thrinax radiata (Florida Thatch Palm). Комментарий в: what,s the colorsHi Jeff, I'm not sure what you're asking. 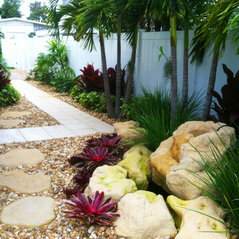 If you're asking about the pops of reds in the landscape, those are bromeliads. Комментарий в: Getting ready to sell my first townhouse- lots of work went into this!Love the tile work in the bathroom. What a cool way to give white tile a personality!